It's such a powerful scan that it really jumps out the page at you. Nice work on the background and the colours work well done. Nice work ^^ . I love whole light effect thingy, looks really cool. I also really like the redness of the wallpaper along with the scan, good wall! in black with red in background splendid !!!!!!!! how can u make renji sooooooooooooooo handsome!!?!?!?!?!? oh my gosh!! !oh my gosh!!!! Renji is the best !!!!!!!!!!!!!!!!! ^_____^ thnx for this nice wall !!!!!!!!! i think renji with open hair nice more and this pic is very nice !!!!!!!!!! The background is perfect ! ! ! You have done a great job, Well done. 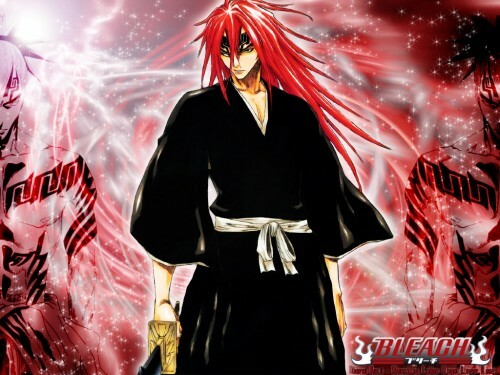 my beloved and hot red head Renji!!!! Thank you so much! Renji is one of my favorites. Probably has the most kick@$$ tattoos I've ever seen! So damn hot!! The best picture of Abarai Renji ! very cool wallpaper of renji.